Help your school get the most out of your JMP academic site license(s). This page provides best practices for administration of academic site licenses, important links, answers to FAQs, tips and other important information for academic software administrators. Is my organization eligible for an academic license? The organization must be be a DGI (degree-granting institution), and all usage has to be non-commercial and limited to teaching, learning and research. Are there any other academic licenses available in addition to the JMP Academic Suite? Yes, we also offer JMP Genomics and JMP Clinical site licenses, as well as single user licenses for researchers, business administrators and students. If you need help choosing an academic license please check our licensing page or contact us at academic@jmp.com. How can I request a formal quote for an academic license? Please send your request to academic@jmp.com. 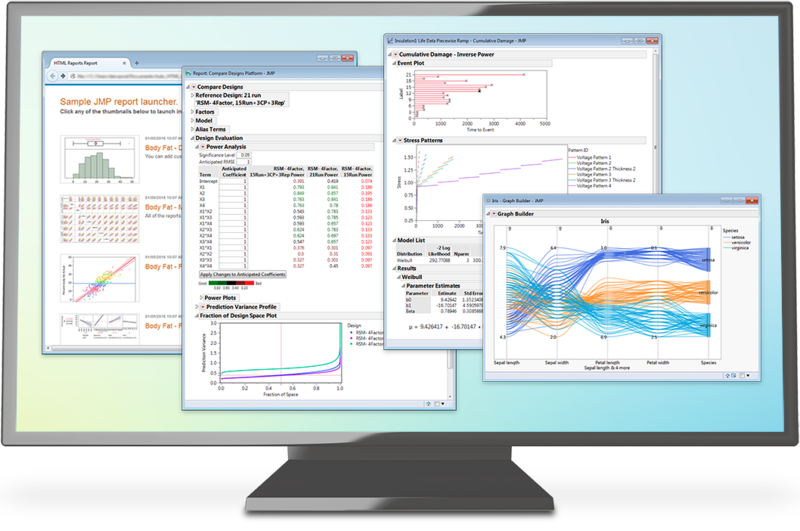 What will our users be missing when we switch from another desktop data analysis or statistical software to JMP? Basically nothing, since the the JMP Academic Suite includes JMP Pro and most features are built-in. Functionality can also be extended with JMP scripting and by integrating JMP with Excel, SAS, R or MATLAB. For native JMP Pro features check the Feature Index or Capabilities Index, or send questions to academic@jmp.com. Will your academic licensing fees change? Annual license cost for academic institutions are relatively modest. The first year and renewal year fees are the same and these prices have not changed for many years. What level of technical support can we expect? In the seldom case that a JMP user is stuck you can rely on SAS’ highly regarded 24/7 JMP Technical Support, available in many countries and provided in different languages. Our technical support team members have strong statistical and programming backgrounds to ensure the best quality of support. Additional help and discussions can be found in our JMP User Community or JMP Academic User Community. Who is eligible to install and use the Academic licenses? Qualified faculty, students and academic researchers are eligible to use academic licenses. However research conducted for commercial objectives or in the administration of the institution, employees of medical centers, and students not enrolled in the institution do not qualify to use academic licenses. These users may obtain other licenses available through JMP. Please visit jmp.com/buy for more information. Can I deploy JMP on a server or in the cloud? JMP is optimized for local installation and use. Institutions who wish to deploy in a virtualized server environment may request this and require an amendment to the license. Minimum hardware requirements will apply to ensure proper performance. Is there any limit to the number of copies I can deploy? No, the license allows every qualified student, faculty and academic researcher at your institution to install and use the license on campus, at home, and on personal computers. So I get both JMP and JMP Pro. Should I deploy and make both available? JMP Pro contains all of the features in the standard version of JMP, plus additional advanced features for researchers and higher-level courses. Thus, many schools find it easier and more effective to deploy only JMP Pro for Mac and Windows. Our school has purchased a campus license. What will happen next? After signing the license agreement, your site license administrator will receive one email for each product included in your license. These emails will contain the software depot (the installers) with temporary license keys. Once the invoice has been paid, the site administrator will receive emails with the permanent license keys. For more information, see the JMP Academic Deployment Guide.